As you might have gathered, I tend to gloss over the lines in reviews that aren’t quite so encouraging, but there are some. When we dropped off my older son for his first year at University of Guelph this past Saturday, we picked up the local paper, the Guelph Mercury. I was delighted to see that the very positive review of The High Road that ran in the Kitchener Waterloo Record, also ran in the Mercury. It’s wonderful to have positive reviews, although I expect they won’t all be like this one! When we last saw political aide Daniel Addison, the narrator of Terry Fallisâ€™ Leacock Medal-winning novel, The Best Laid Plans, he was trying to recover from the results of an election campaign which both he and his candidate â€” engineering professor Angus McLintock â€” were determined to lose. 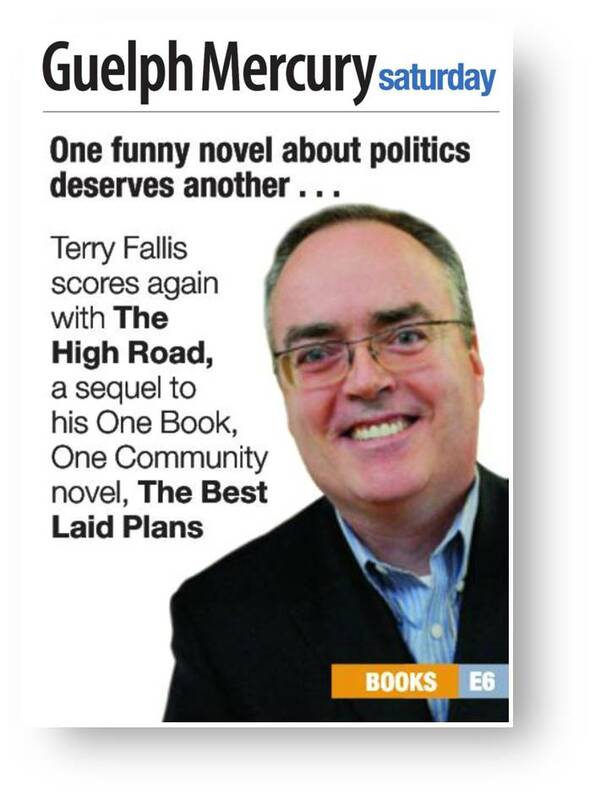 Fallisâ€™ debut novel was a blast from start to finish and in the sequel, The High Road, to be released on Tuesday, he picks up exactly where he left off, chronicling the next steps in the journey of the reluctant parliamentarian and his sidekick. Still grieving his recently deceased wife, McLintock approaches his new political career as a way to survive. Riding shotgun is Addison, a talented politico who would rather be an English professor. The two men share a love of chess and of correcting othersâ€™ grammar errors, but while Angus prefers to sail straight into the fray, Daniel is kept busy in the background steering the boat. Fallisâ€™ talent for alternating between slapstick and sentiment (the good kind) proves that the accolades for The Best Laid Plans were not misplaced. 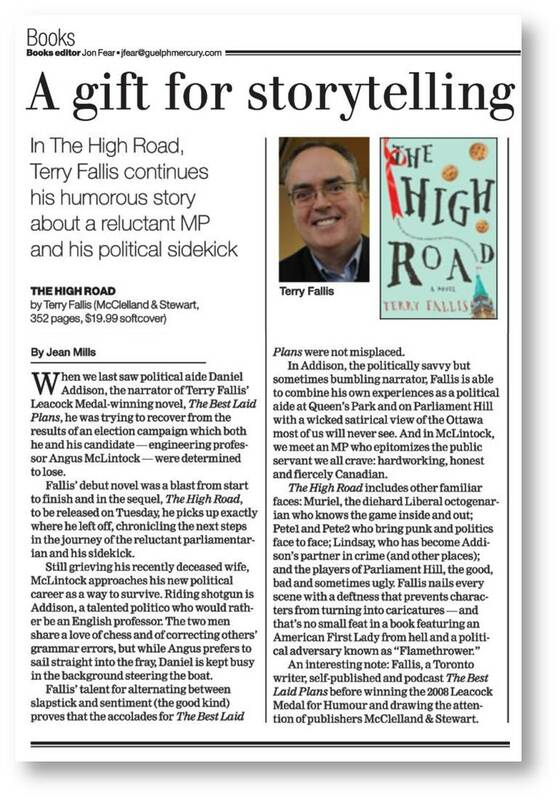 In Addison, the politically savvy but sometimes bumbling narrator, Fallis is able to combine his own experiences as a political aide at Queenâ€™s Park and on Parliament Hill with a wicked satirical view of the Ottawa most of us will never see. And in McLintock, we meet an MP who epitomizes the public servant we all crave: hardworking, honest and fiercely Canadian. An interesting note: Fallis, a Toronto writer, self-published and podcast The Best Laid Plans before winning the 2008 Leacock Medal for Humour and drawing the attention of publishers McClelland & Stewart. The High Road has already been made available as a podcast, but readers will want to savour Fallisâ€™ unique gift for written storytelling. The big question remains: will there be a book three? Jean Mills is a Guelph writer and the author of the young adult novels Abby and the Curling Chicks and Toymakerâ€™s Son (Pugwash Publishers).